Aric Almirola started Stage 1 in the 27th position at Auto Club Speedway and ended it in the 13th spot. By lap four, Almirola had already gained eight positions on the field. The Smithfield driver made his first scheduled green-flag pit stop of the race on lap 27 from the 15th position. During the first caution of the race on lap 38, Almirola visited pit road for fuel, four tires and adjustments to his Ford Fusion. On the final restart of Stage 1, Almirola was in the 14th spot. He gained one position to end the stage in 13th. The 34-year-old Almirola began Stage 2 from the 14th spot and ended the stage 13th. Before the start of Stage 2, the Tampa, Florida, native visited pit road for fuel, four tires and adjustments to give the No. 10 a little more rear grip. On lap 89, the Cuban American made a scheduled green-flag pit stop for fuel, four tires and a wedge adjustment and reached the top-10 on lap 94. When another caution came out on lap 109, Almirola pitted from 10th to go back on the previous adjustments and improve the car’s handling. In a seven-lap dash to the end of Stage 2, Almirola slipped back from 11th to the 15th position after getting trapped in the lower racing groove. Almirola entered the final stage in the 11th position and completed it in 12th. 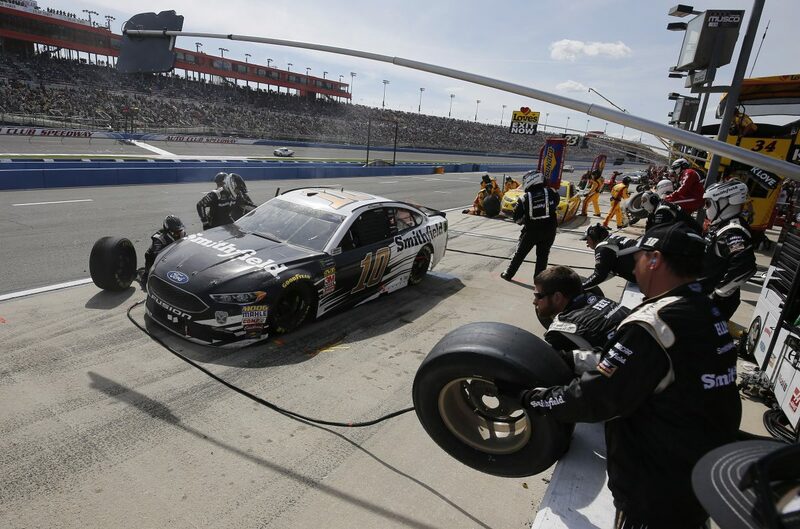 After advancing to the 15th spot, Almirola made his final pit stop of the race on lap 160 for fuel, four tires and adjustments to help tighten up the Ford’s handling. A long green-flag run to end the race allowed Almirola to pass several competitors and end up in the 12th position. Almirola has finished among the top-15 in each race this season. Truex won the Auto Club 400 to score his 16th career Monster Energy NASCAR Cup Series victory, his first at Fontana and first of the season. His margin of victory over second-place Kyle Larson was 11.685 seconds. The next event on the Monster Energy NASCAR Cup Series schedule is the Martinsville 500 on Sunday, March 25 at Martinsville (Va.) Speedway. The race starts at 2 p.m. EDT with live coverage provided by FS1, MRN and SiriusXM radio Channel 90.